Added Retina support to Image object. You can specify an (optional) high-resolution version of the image. 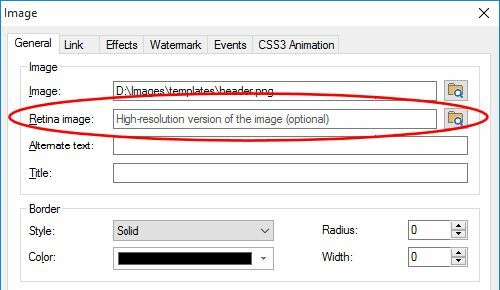 If a high-resolution variant is specified, a script will be added to swap in that image in-place on retina displays. The blog has been redesigned to make it a lot more powerful. It’s now also a great way to quick create lists or (responsive) grids for all types of data. - Added ‘Carousel’ option to the Blog. When this option is active the blog items will be displayed in a (responsive) Carousel! - Item links now support target (new window, lightbox, popup etc), URL parameters, title, mailto, SMS, phone number, file etc. - Added option to specify the image width. - Added the ability to display items in columns. This option is responsive so each breakpoint can have different number of columns. Most navigation objects can now also be used with the CMS tools. The 'Use this menu for CMS' is available for CSS Menu, Go Menu, MenuBar, Panel Menu, Tab Menu, Text Menu, Breadcrumb and Pagination. Added support for nicEditor (http://nicedit.com) in CMS admin. NicEdit is extremely lightweight and has built-in support for file uploads. Added support for SCEditor (http://www.sceditor.com) in CMS admin. SCEditor is another lightweight editor with support for emoticons, YouTube and much more. Added support for Trumbowyg (http://alex-d.github.io/Trumbowyg) in CMS admin. Trumbowyg is a light, translatable and customizable jQuery plugin. Supports images through base64. Added 'Upload image' option to WWB editor. Uses HTML5’s filereader, so no PHP or special setup is required. Added 'Use images for actions' to CMS admin. Specifies whether to use images instead of text for actions. Added 'Search Index' to CMS page configuration. 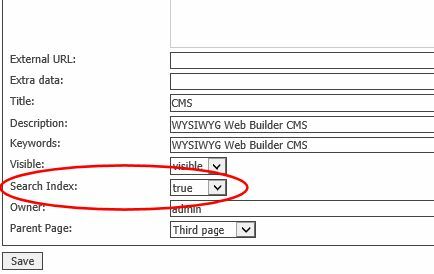 This option specifies whether to include the page in the CMS search index. When set to ‘false’ the page will not be displayed in the CMS search results. Here are a few experimental pages I've created with WYSIWYG Web Builder 11, just to give you an idea of some of the new possibilities. Added 'Aspect ratio' option. Keeps the aspect ratio of the video fixed at 16:9 or 4:3. This is especially useful when the video is part of a Layout Grid, so the video resizes dynamically while keeping the original aspect ratio. When used in combination with 'Fill entire browser window' this will crop the video to cover the entire background (removes black bands). Note: this option is also available for: Vimeo and HTML5 video! Added 'Custom parameters' to add extra features which are not implemented in WWB. For a complete list of available options please check the YouTube API documentation: https://developers.google.com/youtube/player_parameters. •	fall; simulates a ‘falling’ object. •	side fall; simulates an object falling from the side. •	transform-3d-sign; object slides into view from the background. •	super-scaled-in; Scale (2x) and fade an object into view. •	super-scaled-out; Scale (2x) and fade an object out of view. 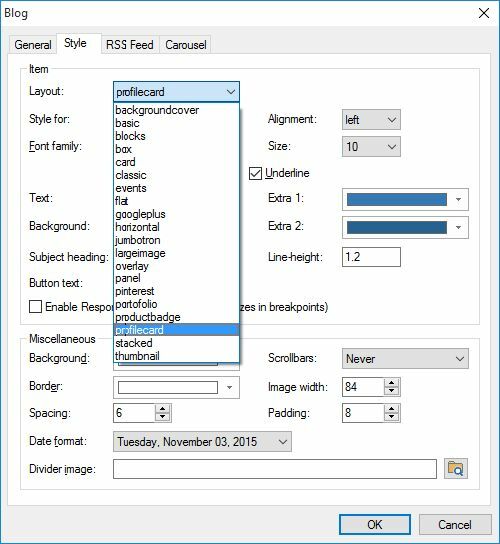 And to conclude this teaser... here's the (almost) complete list of new features for WYSIWYG Web Builder 11 (in PDF). We are working very hard to release it as soon as possible, but it will not be available until we are certain that everything has been tested thoroughly.